Ross having a good day and preparing for his final hunt. Today I woke up to the sound of a gentle rain, and it reminded me of the lyrics to that old song, If Ever I Would Leave You. I went out to the back deck, with “If ever I would leave you, how could it be in springtime?” running absently through my head. The pristine morning with softly falling rain and cheerful birdsong completed a long, sad week of saying goodbye to our beloved, fun loving spirit known as Ross The Dog. Ross was special in many ways, but perhaps what differentiated him from other dogs is that when people got to know Ross, they would say, “I want a dog like that. I want a Ross.” On Thursday, while Ross was out hunting for one last pheasant, I bought a bottle of whiskey aged seven years, same as Ross, so that my husband and I could make a toast to our first family dog. After Van returned with the pheasants and told the story of Ross’s glorious final hunt, we clinked glasses and choked back tears. “To the best pet.” I said. “A good dog.” Van added. It wasn’t necessary to say anything more. 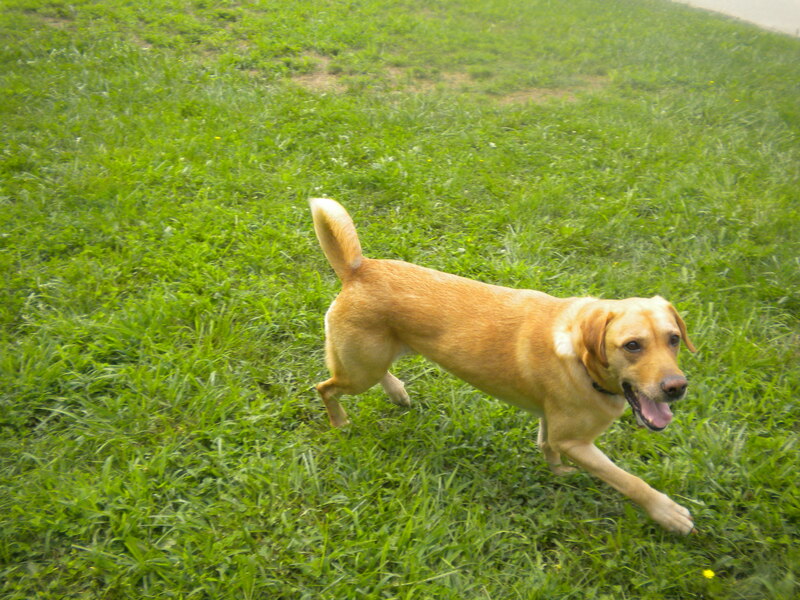 Ross was a dog that broke the mold on canine companions, a dog that set impossible pet standards. 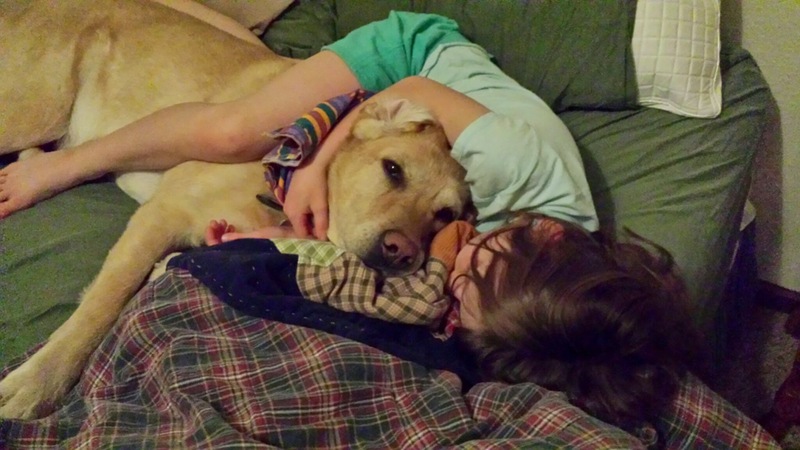 Ross taking a nap with his person, Alexis, this spring. Ross learned that there were little companions to play with and protect. Our children became his new friends, and our youngest became his Person, his life long soul mate. Alexis would sneak food to Ross during dinner, stick her fingers up his nose and in his mouth during inspections, and use him as a pillow or footstool. He was very patient and gentle with her and her siblings. Alexis was the only one who Ross listened to all the time. Listening to me was optional, and he listened to Van most of the time, but he always listened to Alexis. And she could get him to do anything. I didn’t like to take Ross on walks because he pulled on the leash and acted belligerent. With Alexis, he heeled perfectly and stayed on pace with her, and she never had to say a word. Alexis proudly showing off her picture of Ross. During our last trip to the park this week. We always knew our time with Ross would be limited. I still vividly remember how sick he became one day many years ago. We had only recently moved to South Dakota, Ross was just a few months old, but growing fast, and we had become very attached to him. 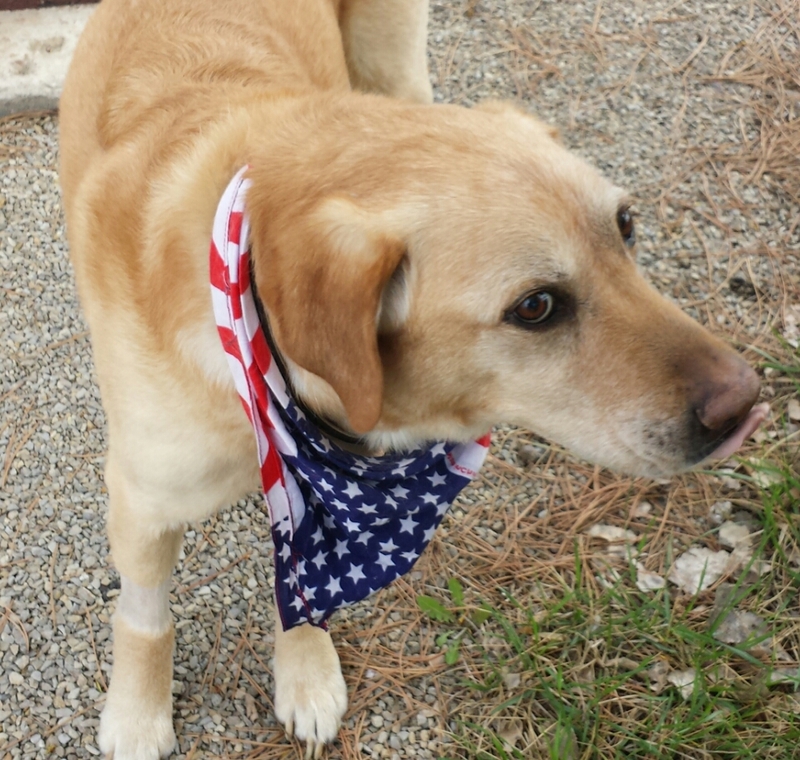 We rushed him to the veterinary clinic down the road from our house. The news was depressing. Ross was in kidney failure and the doctor didn’t believe that he would live to be one year old. One kidney was tiny and deformed, and the other wasn’t detectable on an x-ray. We decided that the best way to care for Ross was to treat him with as much love as we could, for however long he had left. We started him on a special diet and gave him extra TLC every day. And we never, ever took him for granted. He celebrated his seventh birthday this January, a pretty long and successful life for a dog not meant to live more than twelve months! 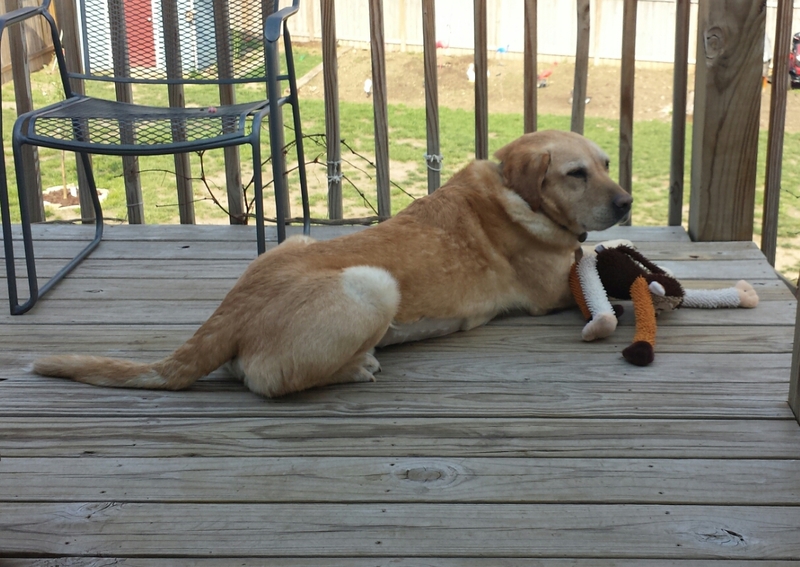 Resting on the deck after returning from his visit to K State earlier this week. Last week he became sick again, and I saw the same signs as the first time. 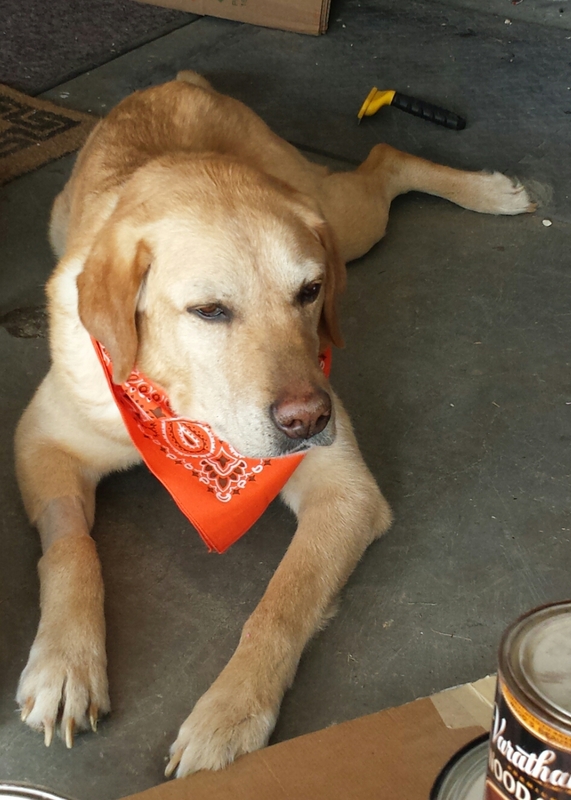 Van took him to the K State animal hospital in the Veterinary Sciences Department. He was kept there for three days under the incredible care of the students and staff, but the prognosis was not optimistic. 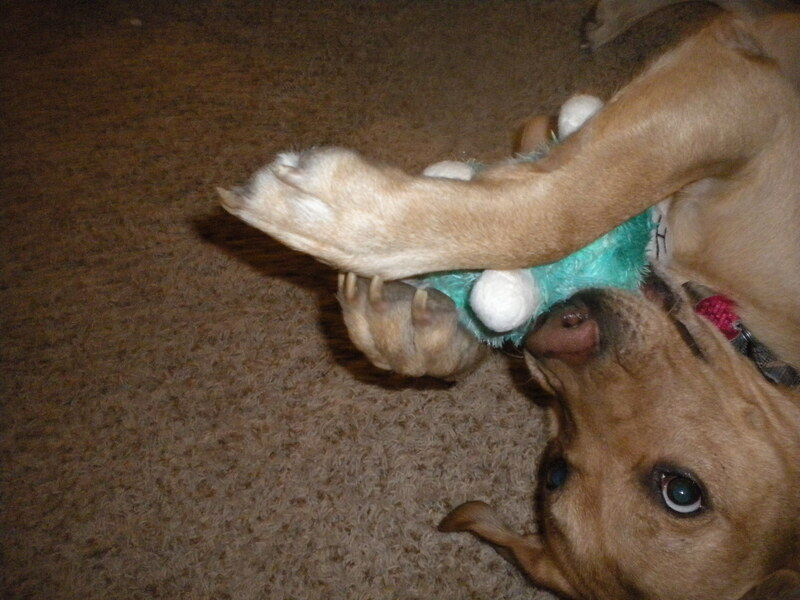 His renal levels were fourteen times what should have killed a dog his size, the veterinarian was mystified, and the one explanation that Van and I could give for Ross living so long was that he was the dog that was meant to be with us at this point in our lives. The student on his case told me that Ross was responding to the medications, and that he wanted to come home, but there was no guarantee how much longer he might live. “We may have only bought you two days, maybe two weeks, optimistically a few months, but it’s just difficult to know.” she said. I felt in my heart the answer. 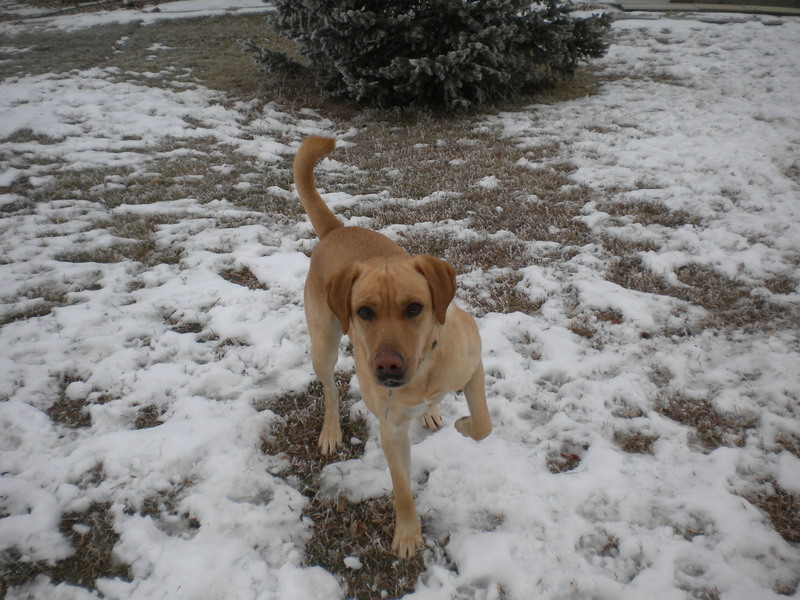 Ross playing in the snow, South Dakota. The night that we got Ross back from K State, I had a dream about him. He was loping to me, all tail wags and happy panting. He was wet and shiny like a bright penny under water. He was young, maybe only three years old, with the best muscle tone I’d ever seen, and his eyes were clear with intent. I didn’t know what he was trying to tell me. The next two nights, I was up with him. He was very restless and had to be let out often. He was vomiting and couldn’t control his bowels, wouldn’t eat or even drink water. It was gut wrenching to see him like this, but I was his Mommy, and I was there to clean him up and take care of him. He seemed to be fighting sleep, as though he suspected that sleep might try to sneak in a more final condition without his approval. Since I couldn’t sleep anyway, I looked up dream interpretations about wet dogs. Nothing. Then I came across a Web sight for Native American dreams and visions. My bright, shiny, wet dog, according to this site, was a reflection of my own personality and my response with the world around me. It would be a few days before I understood the significance of the dream. Ross getting brushed out by his favorite girls. For me, the Mommy of the family, well, I like to think that he did something special, not that I could ever repay the favor. Ross and I didn’t have that Master/Loyal Companion bond since he was officially Van’s dog. But Ross knew his job was to protect the family and be a friend. He spent more time with me than anyone else. 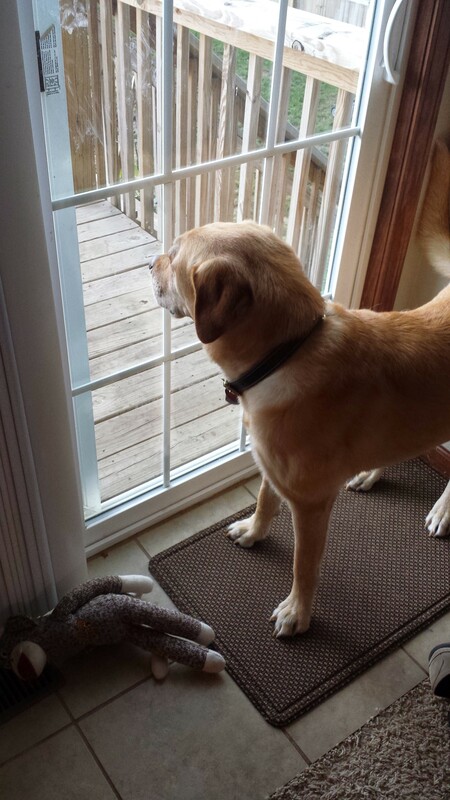 When Van was deployed or on a training mission, Ross never shirked his duties as the guardian of the home. And when everyone left the house for work and school, Ross followed me around, got in my way, stole my place on the couch, took naps with me, rode with me in the car, played with me in the yard. Most importantly, he listened to every word I said. I told him all my problems, all my dreams, all my secrets. He probably knew me better than any person! I could look at him and get an idea of what he might be thinking, and when the time came, I knew that Ross needed me to have strength that he no longer possessed, to encourage the family to let go. He might have gone on living for another week or longer out of sheer willpower, but what kind of a life would it have been? I told my husband that Ross seemed happy but that he also seemed to be waiting for permission to depart. Van just needed a little time to prepare a final pheasant hunt. I found Ross sitting in the bedroom and hugged him. “Just hang in there for a couple more days, okay?”. He seemed to give a nod of agreement. 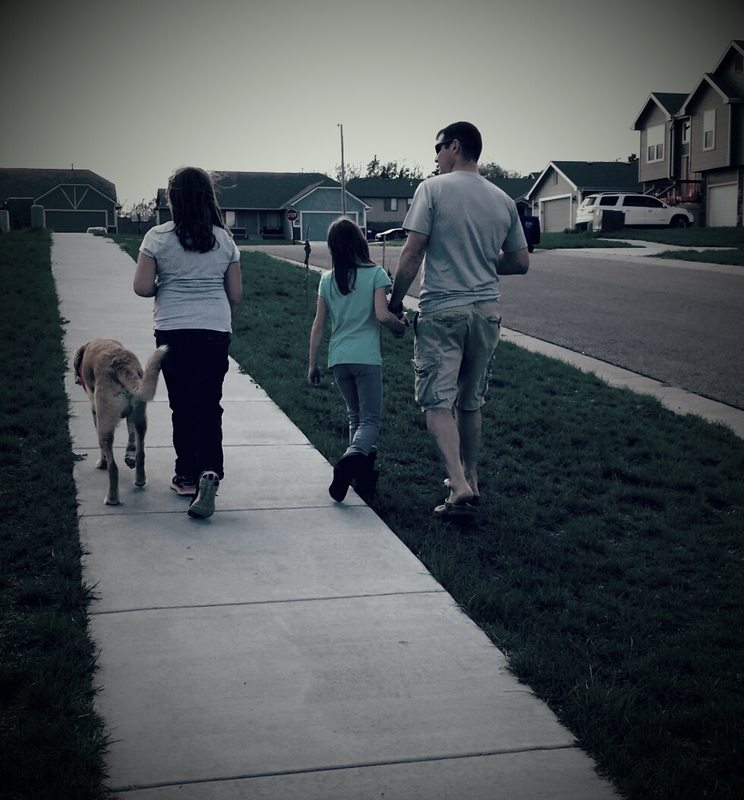 Our family taking Ross for his last walk around the neighborhood. There was no way to really repay Ross for a lifetime of loyalty and friendship but I decided to give him the best last day possible. The things that a dog likes are so simple in nature that they should be a lesson to us all: a ride in a car on a sunny day, rolling in the grass, a nap on an old bed, a crust of good bread, and being with our favorite people. What better way to pass a last day? 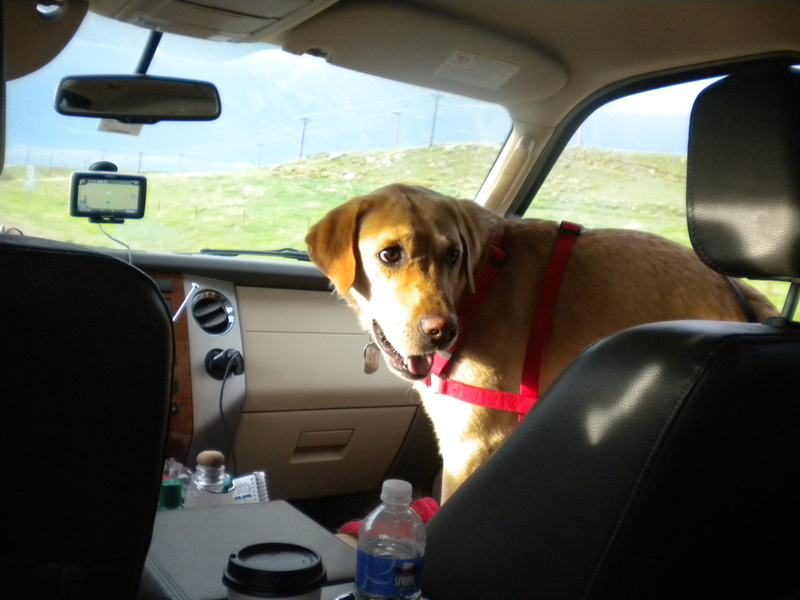 He was too weak to jump easily into my car so I had to boost him in, but he got to ride shotgun once more time as I made my way to a park near Milford Lake. It was a chilly, windy morning, and the park was completely empty, so Ross had the place to himself. I let him run as long as he wanted. The view was quite pretty, although not as beautiful as South Dakota, where we had hoped that he could spend his final day. I wondered if God granted dogs the ability to see in color in their final hours, and I hoped that Ross could see everything for how truly beautiful if was on that morning. Tears started to stream down my face, but great sheets of wind quickly blew them away. Ross paused from sniffing the grass to look at me quizzically, so I wiped my face and we walked through the park together, hot on the trail of a rabbit that was long gone. He tired quickly, so I helped him back into the car. At home Ross seemed content just laying in the backyard. I had been saving half a bundle of sage for a special occasion, so I lit it and let it smolder slowly, ceremonial incense from me to Ross. I laid down on the grass beside him and smelled the sage and looked at the sky. It was a gorgeous day. I opened up the guest room and helped Ross onto the bed, his favorite place to nap, and he sprawled out in the afternoon sun. I peeked in on him and chuckled to see how content he was dozing on his back with his legs flayed and sagging balls flopping out in the afternoon sun — just the way he liked to nap. I’d bought frozen pizzas for supper because the one treat Ross was allowed on his special diet was pizza crust. Van called to tell me that he had found a place for Ross to go on his last pheasant hunt, then he would take him back to K State. He would go to sleep next to Van, with a freshly killed trophy pheasant to dream about as he began to doze. Ross and his favorite toy, a stuffed sheep named Moss. After school we had to break the news to the girls. I don’t want to ever have to go through that again, but after the initial shock, the girls agreed to take Ross for a walk around the block, brush him out, play with him in the yard, and feed him pizza crust. He refused the pizza crusts, but did everything else, and more. He even posed for some very touching pictures. We explained to the girls that now was the time for them to tell him what they felt in their hearts and give him all their love so he would be ready for his journey. As much as it hurt to say goodbye, our good memories of Ross are a reminder of the incredible relationship that we, as a family, had with him. When I think about Ross and the impact he had on our family and friends, I have to wonder if it’s possible for angels to appear in animal form. A bonfire tribute for Ross. Ross always hated it when Van built bonfires, probably because of his propensity to go overboard and inevitably blow up something. Ross had a way of giving Van a disapproving look whenever Van was doing something stupid. On Thursday afternoon, after showing me Ross’s beautiful pheasants, Van told me that on the drive back from the hunt, he was able to do one last stupid thing, just for Ross, and Ross gave him one last disapproving look, as if to say “I get it, dumbass!” Last night, Van built a fire in my old chimenea that was meant to put all other bonfires to shame — and it did. 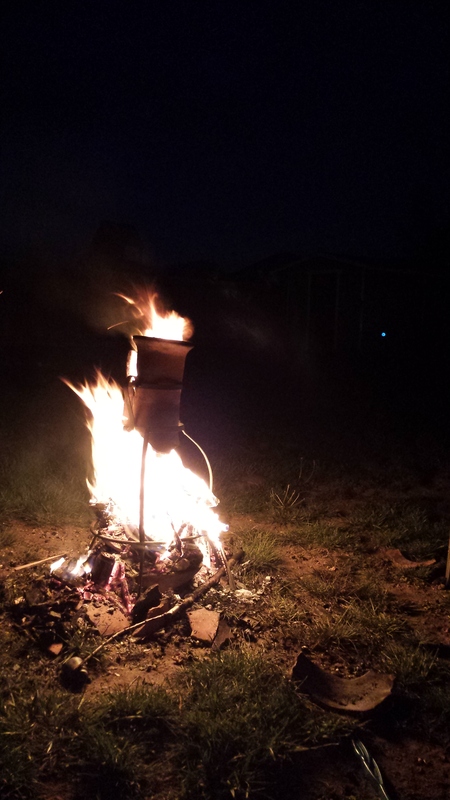 He blew up spray paint cans in it three times, which is how many times it took to completely destroy the chimenea. The third explosion was so glorious that the blast scrambled the video I was taking on my phone (much to my dismay), scattered shards of pottery and burned out paint cans as far as twelve feet from the blast zone, and splattered yellow paint on the deck chairs. 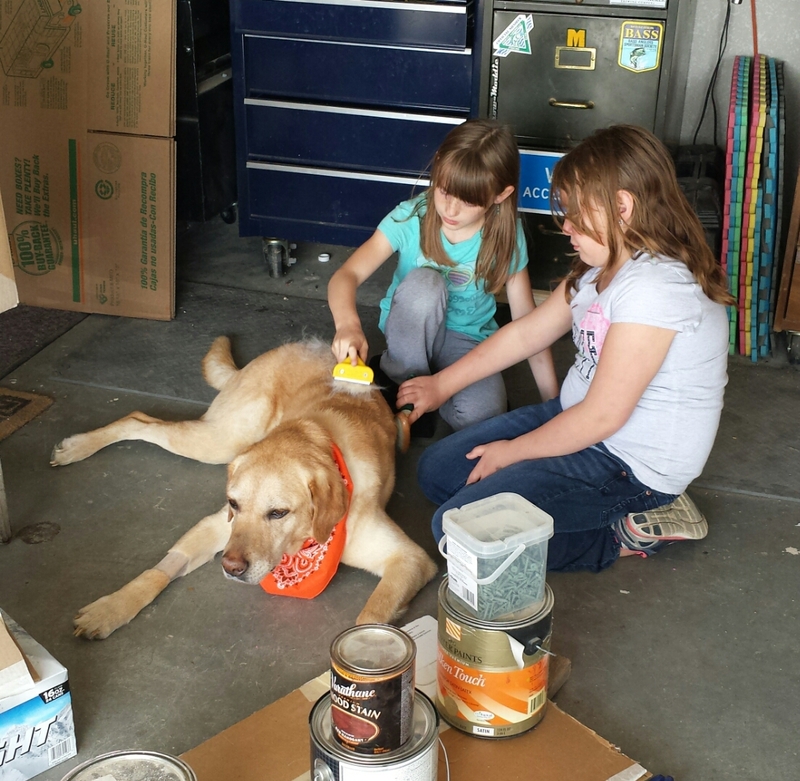 Yellow paint for a yellow dog — very appropriate! Fire and rain are re-energizing, recharging forces of nature necessary for healing and renewal. This morning, waking to the sound of rain, my wet dog dream finally made sense. Ross was not wet from a smelly pond or from bathwater, but from fresh pure rain, he smelled of sweetgrass, looked beautiful, and shone like new a penny. He was healthy, happy, and strong. Call me a batty sentimentalist, but I choose to believe in things that make me feel good. Van’s bonfire was one last tribute to Ross from a bunch of silly, awkward, lost humans, and my dream was a message from Ross to wait for rain. Then tonight around dinner time, the sky opened up with the most beautiful and gentle rainstorm we had ever seen in Kansas, sending cool blankets of the rain billowing down to drench us. We watched the girls play in it for hours, laughing and talking about Ross’s brilliant gift to us for taking care of him. It was just his way of telling us that he saw it, and that he loves us even though we are all dumbasses. 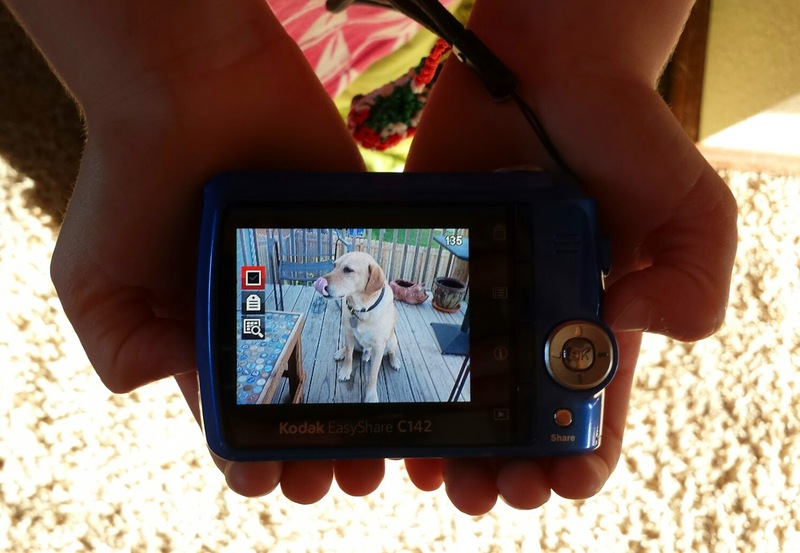 This entry was posted in Life As I Know It, Special Topics and tagged Best Friends, Dog, Dog Story, Dogs, Dogs with Renal Failure, Friendship, Losing a Pet, Renal failure, Ross the Dog on April 17, 2015 by Georgeann.